Lubricated Air, non-Lubricated Air, Inert Gases, Water, Petroleum Products and additional fluids compatible with the materials of construction. Pressure ratings apply to all compatible fluids within stated temperature ranges. Consult Fluid Control Division for alternate materials, alternate coil features including Class H 185oC , other voltage needs etc. 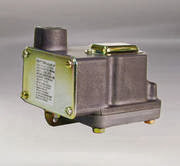 Add Coils codes below for a complete Solenoid Vale Assembly. Encapsulated Watertight Designs. Available as Modular Coils or for Fully Assembled Valves. NEMA 7 COILS AVAILABLE FOR EXPLOSION PROOF APPLICATIONS. Barksdale's D1T & D2T Terminal Block Diaphragm Pressure Switches offer superior accuracy in a robust package, making them the ideal solution to your industrial pressure control needs. These switches are ideal for applications requiring water-tight, NEMA 4 housings a covered terminal strip and tamper-proof external adjustment. (Factory set models are also available.) With pressure ranges up to 150 psi, these housed diaphragm pressure switches are suitable for use in either positive pressure or vacuum applications. Single-and dual-circuit models are available. Housed models feature a durable, anodized aluminum enclosure. For applications requiring a highly accurate switch in a durable package, Barksdale's D1T & D2T Terminal Block Diaphragm Pressure Switches are the ideal choice. NEMA 4 Housing with terminal strip, tamper-proof external adjustment, up to 150 psi. Barksdale's Diaphragm Pressure Switches offer superior accuracy in a robust package, making them the ideal solution to your industrial pressure control needs. Diaphragm switches are ideal for applications demanding instrument class accuracy and where pressure pulsations are less than 25 cycles per minute. 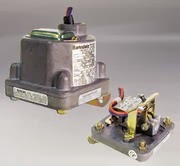 Available in various pressure ranges up to 150 psi, diaphragm switches are suitable for use in either positive pressure or vacuum applications. Single, and dual, and triple circuit models are available. Housed models (D1H & D2H) feature a durable, anodized aluminum enclosure with an integrated 1/2" NPT conduit connector, a tamper-resistant cover for the setpoint adjustment screws, and are rated to NEMA 4 as a standard. For applications requiring a highly accurate switch in a durable package, Barksdale's Diaphragm Pressure Switches are the ideal choice. Stripped, suitable for control box installations with adjustments up to 150 psi. NEMA 4 Housing, tamper-proof external adjustment, up to 150 psi.